Edward & John Harrison kindly provided us with a preview of their remarkable photo book about the large 3D mascots that stand outside stores in Japan. It's called Idle Idol: The Japanese Mascot. The Japanese have long been infatuated with the three-dimensional characters used to represent products, companies, civic organizations, towns and just about anything else you can imagine. 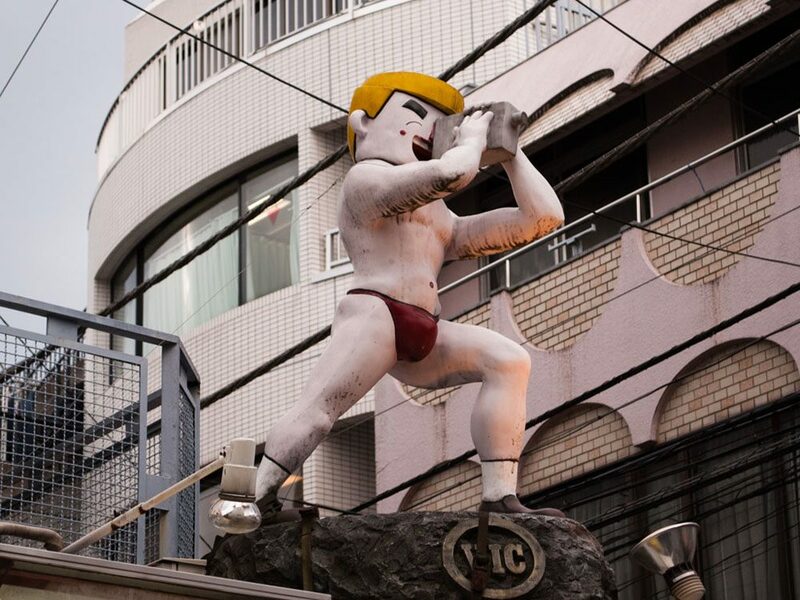 Idle Idol: The Japanese Mascot examines this fascinating cultural history, documenting the evolution of the character statues that are ubiquitous throughout the country today. The mascot trend began during the Edo period with the pot-bellied raccoon-dog Tanuki. These ceramic statues were first used as good luck charms (and they are still used as such today) but starting in the 19th century a noodle shop appropriated the character in an effort to create a link between Tanuki's fortuitous status and bowls of soup. It worked, and since then confectioners, pharmaceutical companies, television networks, food companies, police forces and fire departments have all created mascots. 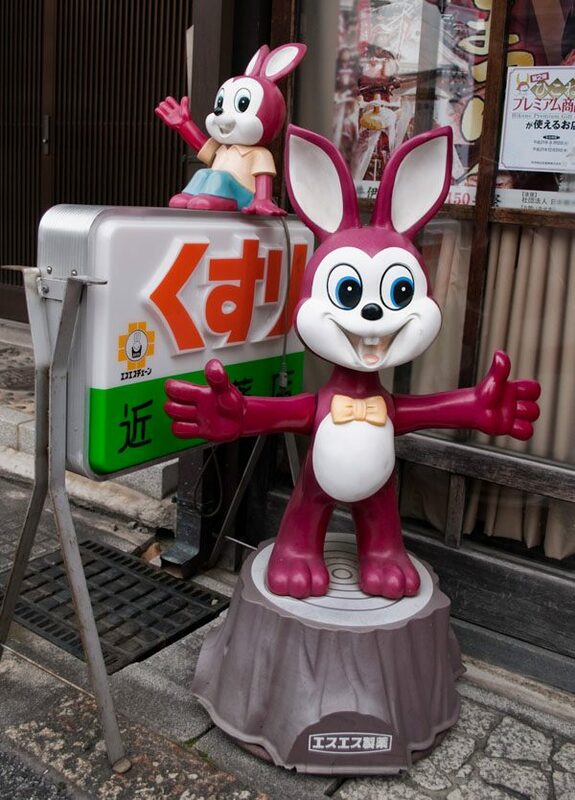 The mascots represent a brand or a certain shop but they also exist as stand-alone characters that people adore. Idle Idol's photographs and written explanations vivify these unique mascots that are artful, audacious and wholly Japanese! 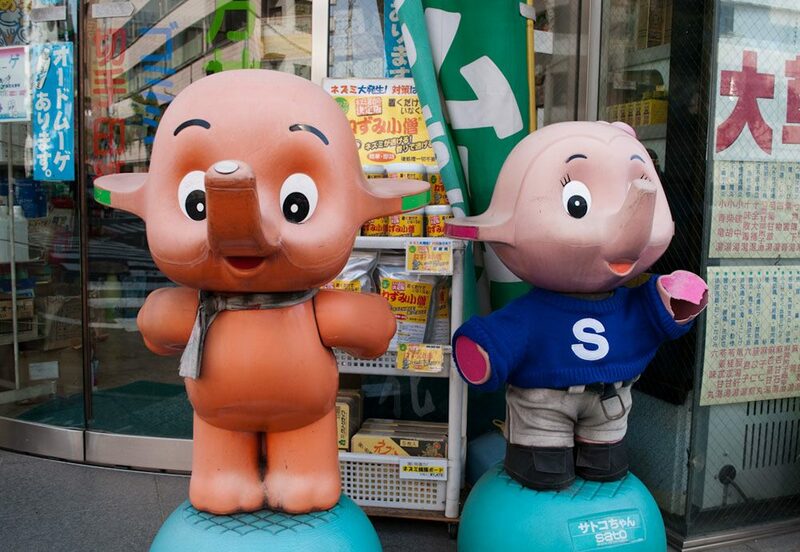 Two of the most commonly found mascots in Japan are Sato-chan (left) and his sister Satoko-chan (right). 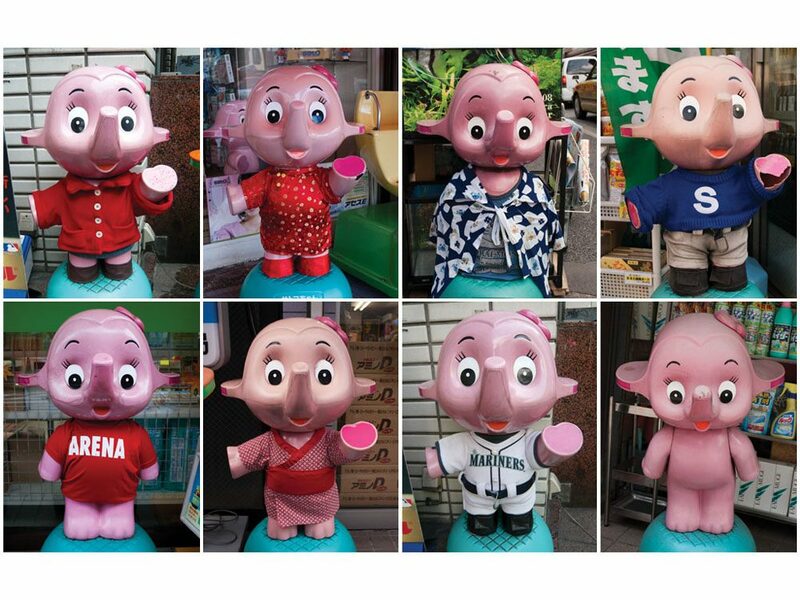 They are the mascots for Sato Pharmaceuticals and are modelled on an Indian elephant which are known to live long lives (presumably the drugs will help customers achieve this too). 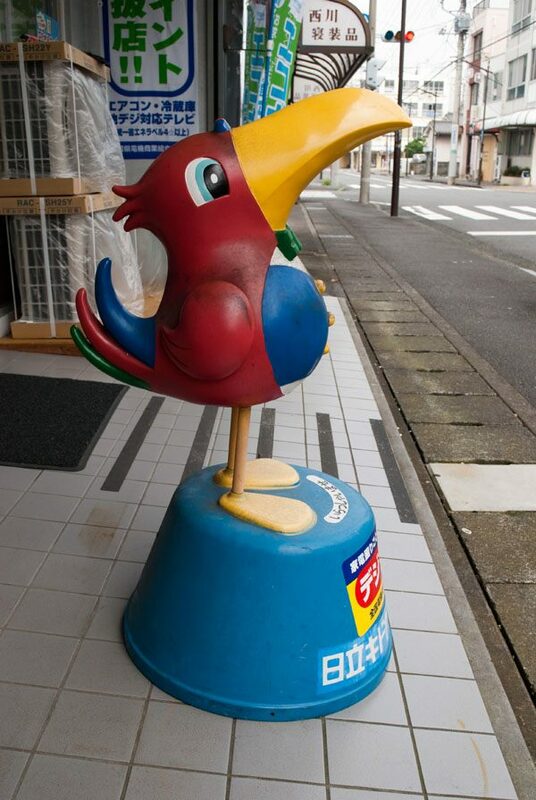 Sato-chan first started appearing outside pharmacies in the 1960's so he's an early example of this form of advertising. Mark spotted a version from the 1970's in the Showa museum in Takayama. To see more photos and find out where a museum dedicated to the pair is, click here. Pyon-chan is the mascot for another pharmaceutical company, this time SSP Corporation (Science and Society Pharmacuticals). Created in 1952 he only received a name in 1963 after the company held a competition to choose him one. The winning entry is a common name for pet rabbits as "pyon" is the onomatopoeia for the sound rabbits (and frogs) make when they hop. Pyon-chan is modeled on the hare in the legend "The White Hare of Inaba," which comes from the Kojiki, one of Japan's oldest books. The story sees the hare skinned alive by sharks and then tricked by deities who suggest bathing in seawater to alleviate his pain, but the hare ends up in even more agony. Masumasu-kun is found in post offices all over Japan where he promotes an investment trust fund. Masumasu means "more and more" and the kanji for masu means a wooden measuring box. The mascot represents making more and more money and keeping it safe in a box. He's portrayed as being curious, thrifty and very neat. 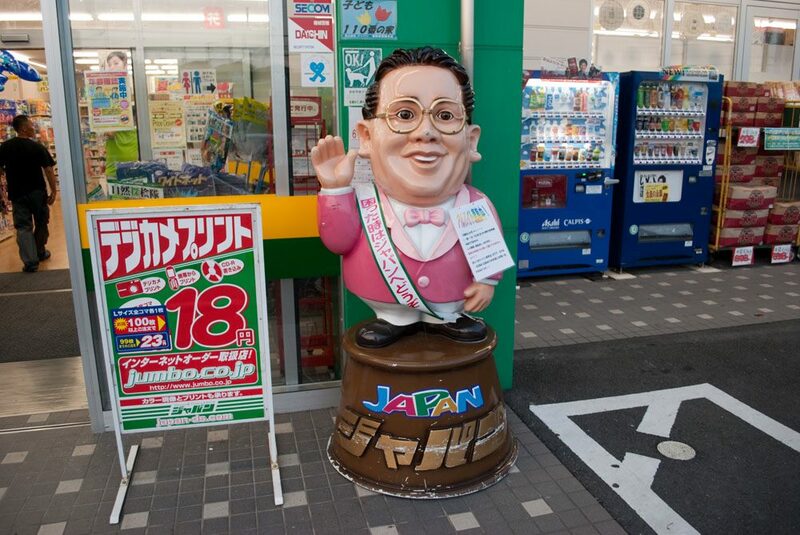 Sawayaka Oyaji or the "Fresh Old Man," proudly greets customers to the discount store called Japan. Modelled on the company president Kanji Kirima I admire the bold and unflattering design. Around his neck is a sash that reads, "If you're in need come to Japan". 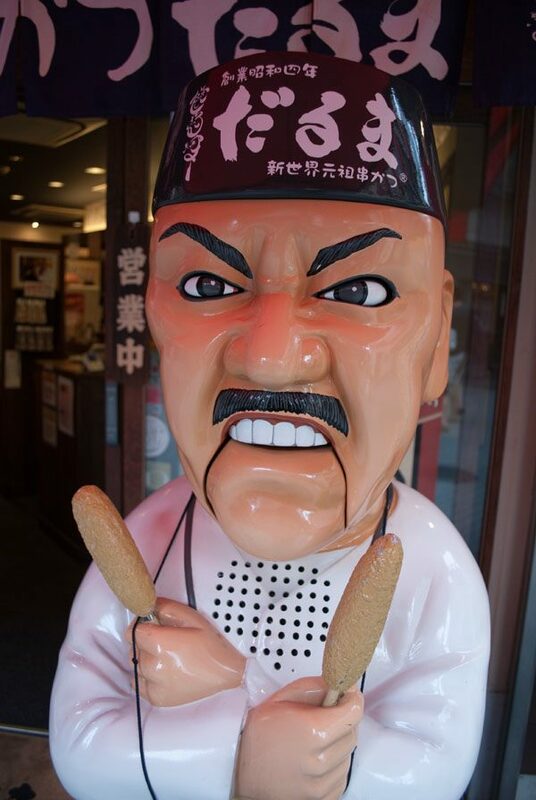 A chain of kushikatsu restaurants in Osaka called Daruma has a mascot based on the owner who stands outside each one of its restaurants. Kushikatsu is mostly meat on sticks coated in bread and egg. In the restaurants you usually sit at a counter and have a container of communal sauce. The sophisticated mascot has bulging eyes and a chin which extends outwards. The constant scowl is there for a reason as he often shouts "Sosu no nidozuke kinshiyade" (DON'T DOUBLE DIP) from a speaker on his chest. The final and perhaps my favourite boss mascot is modelled on Higuchi Toshio the founder of Higuchi Pharmacy. 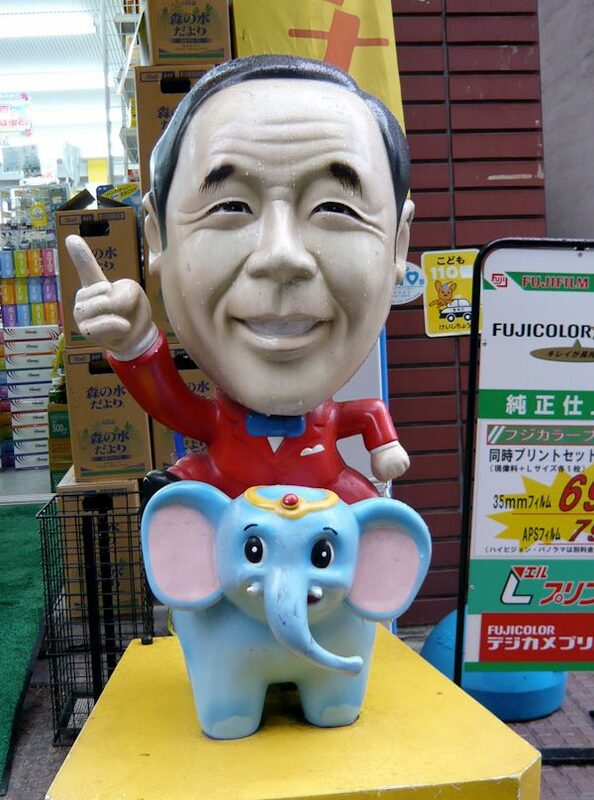 In an early commercial Higuchi-san rides an elephant and declares his goal of opening 1,327 stores. I've no idea why he chose that particualar number but unfortunately he's still yet to reach his target, I suspect its because not all his stores have this awesome awesome mascot. 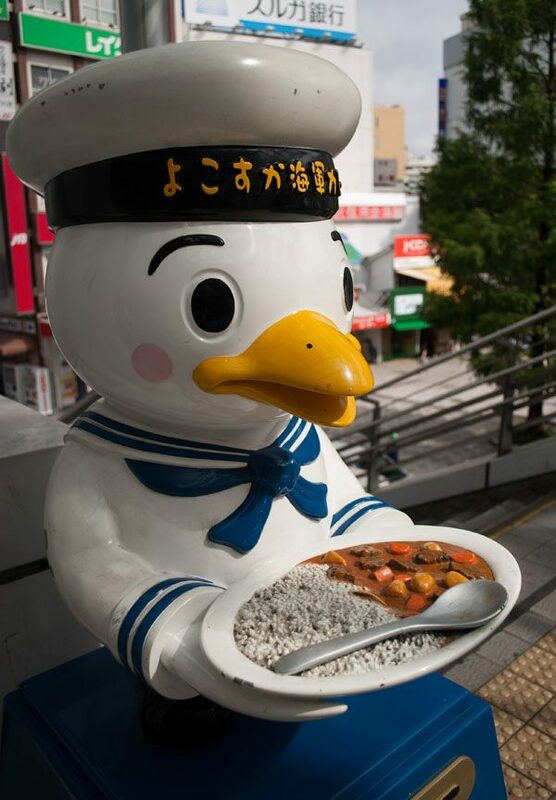 Sukare-chan is the mascot for Yokosuka Navy Curry and stands outside the Yokosuka train station and in other places throughout the city. When Japan opened its doors to trade in the Meiji era the first ships came to the port of Yokosuka, the city adopted the curry brought by British sailors and created a Japanese version. His name comes from a combination of Suka from "Yokosuka" and kare from "curry." Outside the police museum in Ginza stands Pipo-kun the mascot for the Tokyo police force. The first two sounds pi and po come from the English words people and police. 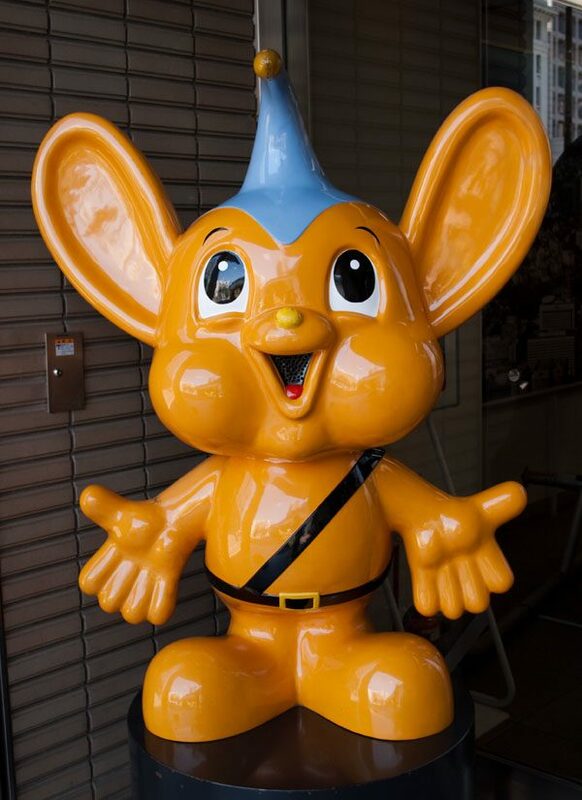 He has big ears to hear people in trouble, an antennae to catch quick movement and according to his website big eyes to watch every corner of society. To see more of Pipo-kun click here. The colourful pelican promoted Hitachi's color television called Pompa, released in 1968 and touted for how quickly it turned on. The name comes from Hitachi's slogan: "press the switch--pom--and it turns on--pa". Hitachi had a steam train called Hitachi Pompago, which had Pompa-kun on the front, it traveled around Japan for eight months showcasing the new television. In Japanese folklore, kappa, or river children, are sprites thought to live in marshes and rivers. Legends say that kappa are mischievous, eat cucumbers and children, but are often very polite. 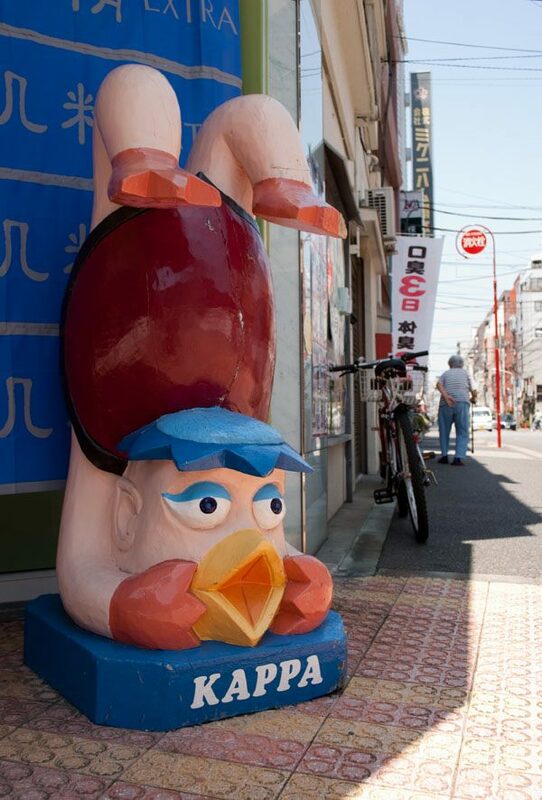 Kappa appear in various forms on Kappabashi-dori, a street otherwise known as kitchen town. The street and surrounding area have hundreds of specialist shops that supply restaurant owners with everything they need from pots, pans, uniforms and cash tills to store-front mascots and plastic food. It was named after a prominent merchant called Kihachi Kappaya who, legend has it, had the help of many kappa in building an embankment and bridge. Not far from the street is the only temple in Japan to honor the creatures and one which claims to have a mummified hand of a kappa. With its strong association to kappa, the street adopted the creatures as its mascot. Sento-kun is the official mascot created for the 1300th anniversary of the city of Nara, celebrated in 2010. Sento can be translated as "moving the capital," which is what happened when Nara replaced Fujiwara-kyo as Japan's capital. 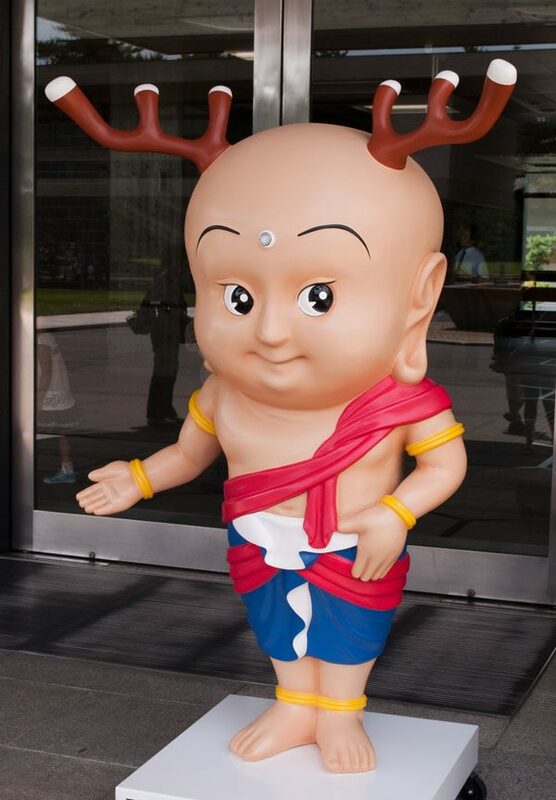 Sento-kun combines the image of a young Buddha with deer antlers. The mascot celebrates Nara's Buddhist history and the deer who roam the city. In February 2008, Sento-Kun was unveiled to the public and immediately drew criticism. 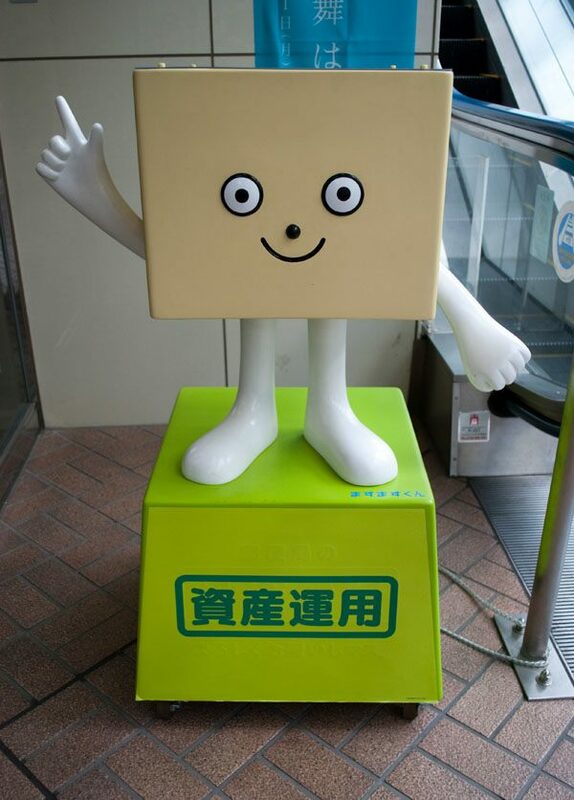 Some religious groups thought Sento-kun was insulting to Buddhists and local citizens expressed anger at the amount of public money spent on the mascot. The biggest concern, however, was that the character simply wasn't cute enough. In response, local residents campaigned for a new mascot and set up a contest where the public voted for their favourite. Find out more on the mascot rivalry in Nara here. I don't know the official name of this mascot and he doesn't appear in Idle Idol: The Japanese Mascot book but he's one of my favorites. He can be found in Kichijoji on top of a video and electronics shop. The retro video camera, his worrying expression and the fact he's only wearing a small pair of red pants make him one of the most unusual mascots I've discovered in Japan.